If there is one thing as a backyard veggie grower that makes me angry, it is slicing into a juicy red tomato and finding it full of disgusting little wriggling fruit fly grubs. All of the months of work and effort that have I have put in are totally wasted. All that I can do is to toss the tomatoes into the rubbish bin, leaving me with with nothing but a feeling of frustration – and a salad without tomatoes! So this year, I am determined not to let fruit flies get my tomatoes, so I have set up a insect proof shelter for my tomatoes as a trial! Last year, as well as using numerous fruit fly traps, I used insect proof bags that proved to be a real pain in the neck to put onto every cluster of fruit. In spite of the effort I made, I still had fruit fly maggots in the tomatoes. 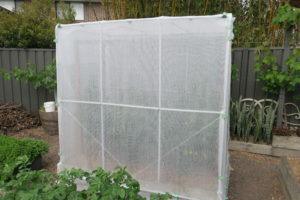 So this season I am going all out and covering the entire tomato crop with an insect proof mesh so that there is no chance that the fruit flies get in. Read on to discover how I went about building the covers and at the end of the blog, I’ll tell you: 1) where I got the mesh from, and 2) about a special offer for HBVG readers. I have timber garden beds which made it easy for me to drill 4 evenly spaced holes 20 mm deep along the top of each long edge of the bed (8 holes in total). Into each I inserted a 1.6 m length of conduit and fastened them in place by screwing a timber screw through the side of the bed and into the base of the conduit. I connected a 90 degree elbow to the top of each upright and connected them to the corresponding upright on the other side of the bed using a 1.2 m piece. I joined the 4 frames by attaching 2 x 1.8 m pieces to the elbows with cable ties. I measured the halfway mark of the uprights and attached more conduit with cable ties (2 x 1.8 m and 2 x 1.3 m pieces). To ensure there were no sharp edged to damage the mesh, I drilled a hole at the end of each conduit, ran a cable tie through the holes and attached them flush with the uprights. To further stabilize the construction I added a string brace to the frame. At the middle of the corner uprights I tied a string to each corner and tied it at a 45 degree angle to a nail on the timber bed (not visible in this pic). To complete the supportive framework, I screwed a conduit all around the timber bed so I could eventually secure the mesh. 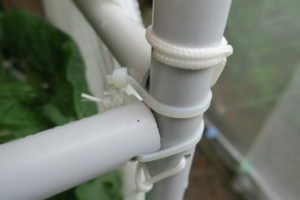 The narrow side was attached first by attaching it to the bottom on one side, pulling it tight across the top and connecting it to the bottom of the other side. I secured the edges by pulling it tight across the top and sides and attaching more clips. 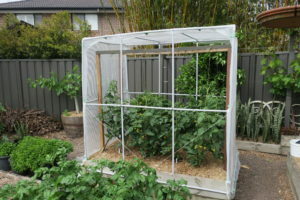 I then repeated this process with the larger piece of mesh and the tomatoes were completely encased in an insect proof house. 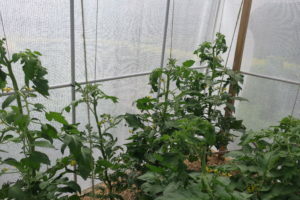 I am able to unclip the bottom and one side and gain access to the tomatoes to prune, spray and hopefully soon harvest bucket loads of tasty red fly free tomatoes. 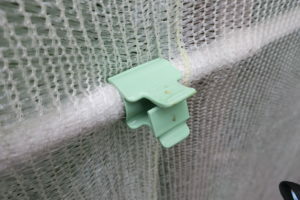 I have been using this mesh for my Broccoli for a couple of seasons and it works really well. Every time I post pictures I am asked where I get it from and I have been letting people know how easy it is to get hold of and use. I get it from Judy’s Veggie Patch. I simply order it and it arrives at my front door. 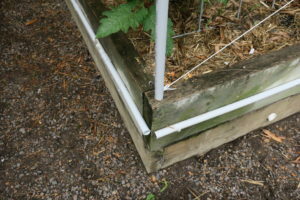 It’s a great web site where you will find many different ways of building insect proof garden beds. It even helps you calculate the size of mesh you need depending on your frame design. The Insect proof mesh has worked well so far. In fact, it was doing so well I decided to build a second one and cover my Cherry tomatoes too. 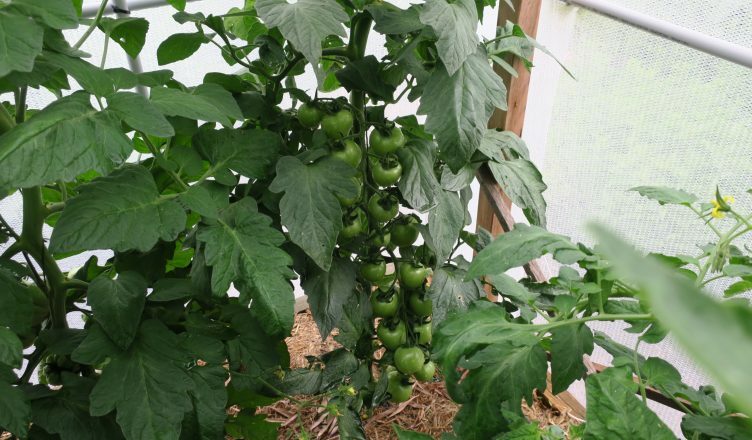 For readers of this blog, and followers of the Hunter Backyard Veggie Growers Facebook page I have been able to secure a discount of 10% for any purchases made from Judy’s Veggie Patch from today until Christmas 2017. Just quote the coupon code HBVG10 as you pay for the goods and you’ll get the discount. Easy as that. 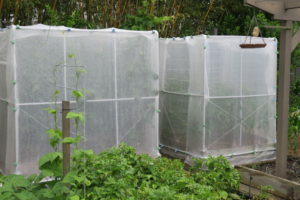 When you cover your tomatoes this way, you trap all the insects that are already on the plants. Spray them a couple of times after you cover the crop to get rid of them before the population gets out of hand. The Four Steps to Powdered Ginger Heaven. They will need to be hand pollinated like large green houses do. Panuara. Fortunately tomatoes are pollinated by movement. The mesh allows sufficient wind through to do the job. Will get Terry to check out what we need!! So far no FF’s on our tomatoesl Only furry 4 legged things attacking our things. Hi, I love the idea of the insect mesh, but wondered about pollination, if the insects can’t get in? 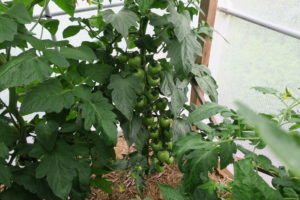 Hi Liz, Tomatoes are wind pollinated and don’t need insects fortunately. I have had good success for a couple of seasons with tomatoes under mesh.